Click on the maps to enlarge them. They will open in a new window that you can move aside in order to be able to read the text. Where possible, bibliographical information appears in the form of in-text citations, which refer to items in the bibliography in this column. 1. Trollope agreed with Stanhope that Balzac invented the recurring character, but in his full reply he is careful not to admit to direct influence (he is “told” Balzac is the man who … ). It may be Trollope was influenced more by Thackeray (as a few critics have suggested): he is unusual in his era for praising Thackeray for the achievement of recurring and aging characters across time and in a partly imagined apparently real single place (Thackeray 115, 127), but Trollope specifies that Thackeray has created novels which are “slices of biography” or memoirs, while Balzac created worlds. Trollope's achievement is thus more reminiscent of Balzac. But see Wall. 2. FP 14:184: “I almost fear that it will become necessary, before this history be completed, to provide a map of Barsetshire for the due explanation of all these localities” See Knox's Ramble and both Tingay's essays . All but two of the maps come from older books printed more than 70 years ago (the Geroulds' guidebook, a first edition of Sadleir's book, and editions of the novels in question) or old xeroxes handed me. 3. The Geroulds' guidebook draws nine such maps from the Barsetshire and other of Trollope's novels, which help readers to understand literally, socially and politically some of what goes on in them ( A Guide). It includes a 6 page double-columned list in extra small type of London places (A Guide 142-47). 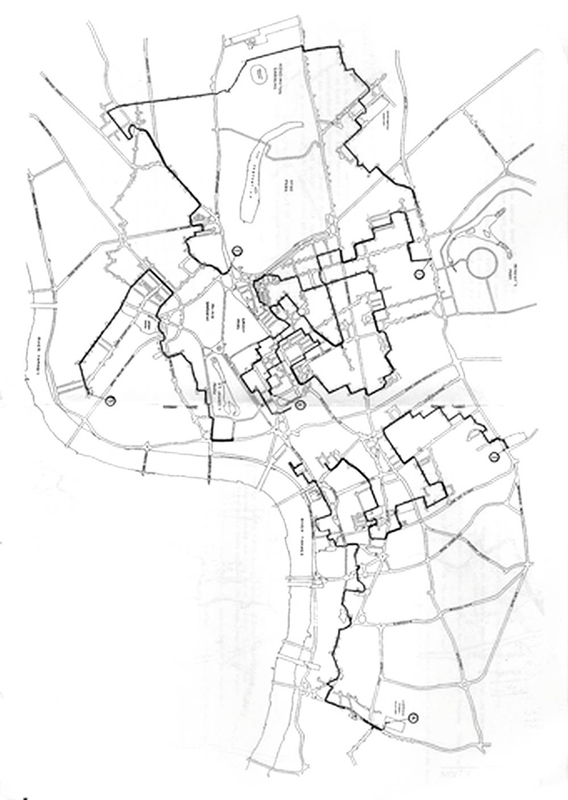 They provide material for making an equivalent map for Trollope's London as is found in Moretti ( Atlas 75-134) of Balzac's Paris, and Edward Bulwer-Lytton and Dickens's London (see Map 3 in packet where Streeten and perhaps other mapped Trollope's central London). At the same time it's rare you can name a real house Trollope meant to describe for certain with all details matching up. An exception is Lady Mason's house in Orley Farm. As described by Trollope and drawn by Millais, Orley Farm is an accurate depiction of the Julians Hill farmhouse in which the Trollope family lived while Trollope was growing up, see Snow 34, and Hall, Illustrators 50-54. 4. On the publication of Castle Richmond while Framley Parsonage was appearing in monthly instalments in the Cornhill, the critic for the Saturday Review remarked: “Mr Trollope is in the position of a man who, after becoming the father of an enormous family, takes at last to having twins ...” Smalley 113. 7. Tracy sums up this novel's themes this way: the “central issue is man's need for a place in the traditional social order, a placed based on ownership of land, and the rapid decay that can take place in a society when traditional order is weakened. The Senator stands outside the English order entirely and calls all its basic assumptions into question” (210). 8. Sadleir's dismissal of Trollope's Irish novels as failures attributable to a misapprehension on Trollope's part of his gifts shaped much that was written until the 1950s. Sadleir appears not even to have read them through, see Moody, Trollope on the 'Net 7-8. 9. The standard Oxford Companion to Irish Literature dismisses Trollope in one paragraph, in which the two Phineas novels go unmentioned (573). There is a separate entry only for The Macdermots of Ballycloran (334). The book includes many an Irish writer who moved to England and wrote books set in England (e.g., George Moore, Oliver Goldsmith) and Anglo-Irish Protestant ascendancy writers (e.g., Maria Edgeworth). From any many examples of the new spirit which rightly includes Trollope in the history of Ireland and its literature, see Foster, “'Fatal Drollery:' Parliamentary Novels;” Edwards, Wittig, and Corbett. See also Lonergan. Exceptions seem to be those who've studied Trollope's 18 years of life in Ireland, his parliamentary politics and his postal career, e.g. Maxwell, Hynes “Creative Culture Shock” and “Masterpiece,” and Cronin, Forster, “Adopting Ireland;” Edwards, “The Irish Writer.” Richard Mullen declares Trollope “a great Irish novelist”, see “Ireland” in Penguin Companion 233-36. Trollope cites obscure and famous Irish writers (as covered by Flanagaan); later in life in his “The Editor's Tales,” specifically “The Turkish Bath” and “The Panjandrum” (a story about his earliest experiences as a writer), he writes of “an Ireland of literature,” a “special country” of the imagination where people seem to go mad from stress (“The Turkish Bath” 79). 10. Throughout Trollope's oeuvre so many Irish characters appear, and Trollope comments on Irish politics so often, that his references to Ireland are uncountable. Two examples of how Trollope keeps using Irish political issues in his fiction: Sir Abraham Haphazard's deep engagement 'in preparing a bill for the mortification of Irish papists,” Warden: 94; Hugh Stanbury's article on “the Irish Church” in HKHWR 147. And from his non-fiction: Trollope's “Irish Church,” Misc. Essays:82-90. See Moody, Trollope on the 'Net, 7-29, 31-46. 11. To be specific, Devonshire, Cornwall, Somerset, the greater part of Dorsetshire, the Channel Islands, part of Oxfordshire, Wiltshire, Goucestershire, Worcestershire, Hereforeshire, Monmouthshire and the 6 Welsh counties. During these 2 years he, his wife and sons migrated from Exeter, to Bristol, to Carmarthen, then to Cheltenham, and Worcester. 12. Ulster, Meath and Louth. 13. Tracy tells where Trollope traveled, when and the political events and Home Rule and tenant rights conflicts he had in mind, “Instant Replay” 31-34. 14. Trollope also lived nearby in Milton Malbray for 3 months in 1845. 15. Owen supports Mallow's famine relief efforts while Herbert leads Kanturk's. I owe the names of real towns and topographical relationships to Jeremy Godfrey, a member of the listserv now called Trollope19thCStudies (at Yahoo) who read Castle Richmond with the group and lived in the very area in which Castle Richmond is basically set. See record on on-line reading of Castle Richmond, “Topography,” Sat 1 Sept 2001, Document uploaded 11 January 2003. 16. Readers have ignored the lesson Trollope meant to teach about Phineas's choice to carry and show his deadly weapon; see his ironically-put sound argument deflating the whipped-up paranoia over garrotting in the 1860s, and his view that carrying a deadly weapon endangers the person with it more than professional criminals: “The Uncontrolled Ruffianism of London, as measured by the Rule of Thumb,” reprinted in Writings for St Paul's Magazine, I:419-24. 17.In this emphasis the novel may be likened to Dickens's later novels (e.g., Little Dorrit) and Balzac's (e.g., Pere Goriot). See Rob's remarks on Norah Stevenson's Paris dans la Comedie humane de Balzac (Paris: Courville, 1938). See also Moretti, Calvino, Brooks. 18. See my discussion of how well Raven's outlook is suited to Trollope's Pallisers, “Intertextuality in the Pallisers,” 155-56, 165-69 especially. 19.Trollope says that Madame Max “dealt out sovereigns – womanfully” and “had no scruples as to paying for the evidence which she desired to obtain” (56:144), but does not make the coins part of the explicit scenes. In the book Madame Max is said to have come twice so the reported dialogue is a compound of two scenes. 21. EBB and Trollope quarreled over Trollope's use of the lines because she did not like that Trollope consciously implied the lines are narcissistic on the part of the poet, that poets are no different from any other people and not separated; Phineas must get over his depression and shock at discovering how other people have seen him (and thus accept themselves). However, since the novel gives such a large space to Phineas's alienation and (unlike the film) has Phineas refuse office out of his disillusion at its close, one can read the use of the lines as consonant with the way Trollope thought EBB intended them. EBB herself denied this intention. They communicated at third-hand, through Trollope's brother, Thomas, and what I suggest here comes from inferences I've taken from Thomas's text as well as my reading of Trollope's novels in general (Hall, Letters 1:115). 22. Excellent traditional thematic analyses may be found in apRoberts and Hynes. 24.Robbins persuasively argued for a more or less consistent general chronology across both the Pallisers and Barsetshire books as one series; he extends the creativity and unity of Barsetshire Hennedy demonstrates in his study. apRoberts, “The American Senator: Trollope's One World,” South Atlantic Quarterly 68 (1969):463-77. Auerbach, Erich, “In the Hotel de la Mole,” Mimesis, trans. Willard R. Trask. Princeton: Princeton UP, 1953: 466-92. Brooks, Peter. “The Text of the City.” Web. (reads like a chapter intended for his Reading for the Plot: Design and Intention in Narrative (Cambridge: Harvard UP, 1984). Calvino, Italo. “The City as Novel in Balzac,” Why Read the Classics?, trans. Martin McLaughlin. NY: Vintage, 2000. 139-45. Cadbury, William. “Shape and Theme: Determinants of Trollope's Forms,” PMLA 78 (1982): 326-32. Cockshut, A. O. J. Anthony Trollope: A Critical Study. London: Collins, 1955. Corbett, Mary Jean. Allegories of Union in Irish and English Writing, 1790-1870: Politics, History and the family from Edgeworth to Arnold. Cambridge: Cambridge UP, 2000. She devotes a long central chapter, and her conclusion to Trollope's novels. Cronin, John. “Trollope and the Matter of Ireland,” Anthony Trollope, ed. Tony Bareham. NY: Barnes & Noble, 1980: 13-35. Edwards, Owen Dudley. “Anthony Trollope: the Irish Writer,” Nineteenth-Century Fiction 38 (1983):1-42. Foster, R. F. “'Fatal Drollery:' Parliamentary Novels, Outsiders and Victorian Political History,” Paddy and Mr Punch. London: Penguin, 1993:139-70. Gerould, Winifred Gregory and James Thayer Gerould, A Guide to Trollope. Princeton: Princeton UP, 1948. They map Barsetshire, Allington, Barchester Close, Bragton Estate, Dillsborough, Framley, Greshambury, Guestwick Estate and Ullathorne. Godfrey, Emelyne. Masculinity, Crime and Self-Defence in Victorian Literature: Duelling with Danger. London: Macmillan Palgrave, 2011/13. Hall, N. John. Trollope and His Illustrators. London: St Martin's Press, 1980. _____. Trollope: A Biography. Oxford: Oxford UP, 1991. _____. The Letters of Anthony Trollope. 2 vols. Stanford: University of California Press, 1983. Harvie, Christopher. The Centre of Things: Political Fiction in Britain from Disraeli to the Present. London: Unwin Hyman, 1991. Harvey, Geoffrey. “The Form of the Story: Trollope's The Last Chronicle of Barset,” Texas Studies in Language and Literature 18 (1975):82-97. _____. The Art of Anthony Trollope. NY: St Martin's, 1980. Hennedy, Hugh L. Unity in Barsetshire The Hague: Mouton, 1970. Hynes, John. “The American Senator:” Anthony Trollope's criticial 'Chronicle of a Winter at Dillsborough,” English Studies 69 (1988):48-54. _____. “'Anthony Trollope's Creative 'Culture Shock:' Banagher, 1841,” Eire-Ireland 21 (1986):124-31. _____. “An Eye for an Eye: Anthony Trollope's Irish Masterpiece,” Journal of Irish Literature 16 (1987):54-58. Knox, R. A. 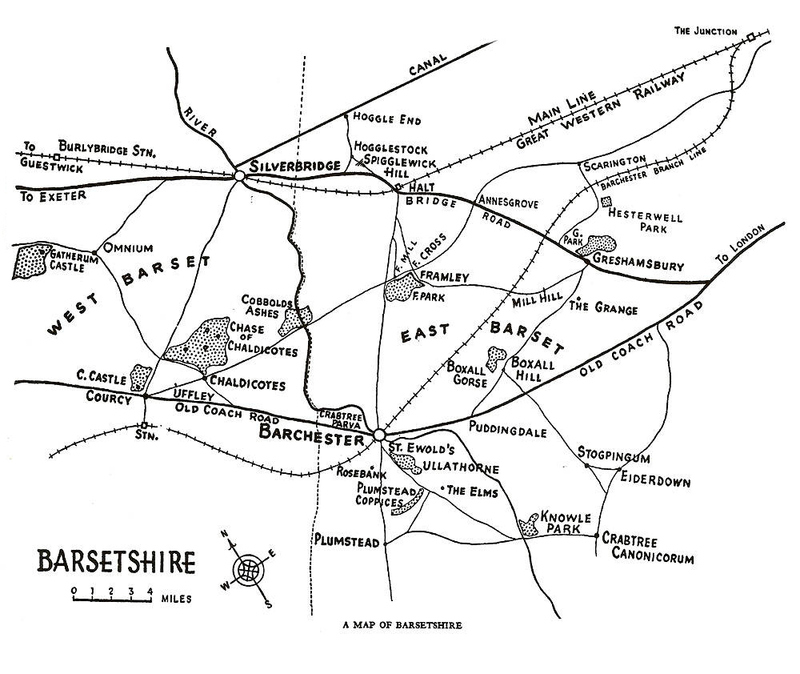 A Ramble in Barsetshire, 5:22 (1922):378-85. Lonergan, Patrick, “How Irish was Phineas Finn,” Trollopiana 58 (2002):15-23. Maxwell, Constantia. “Anthony Trollope and Ireland,” Dublin Magazine 30 (1955):6-16. McCourt, John. “Domesticating the Other: Phineas Finn, Trollope's Patriotic Irishman,” Rivista di studi vittoriani 6 (2001):39-63. _____. “Film Studies: The Pallisers,” 9:18-2:20, “Summary of Themes and Transcripts,” 6/16/2009. _____. “Partly Told in Letters: Trollope's Story-Telling Art.” The Victorian Web Originally Trollopiana (February 2000): 4-31. _____. Trollope on the 'Net London: Hambledon Press, 1999. Moretti, Franco. Atlas of the European Novel, 1800-1900. London: Verso, 1998. _____. “Maps” in Graphs, Maps and Trees, New Left Review 26 (2004):79-103. _____. Signs Taken for Wonders: Essays in the Sociology of Literary Forms, trans. Susan Fische, David Forgacs, David Miller. London: Verso, 1983. Mullen, Richard. Anthony Trollope: A Victorian in His World. Savannah, Georgia: Frederic C Bell, 1990. _____. The Penguin Companion to Trollope. London: Penguin, 1996. Overton, Bill. The Unofficial Trollope. Totowa, J: Barnes & Noble, 1982. The Pallisers Dir Hugh David, Ronald Wilson. Screenplay by Simon Raven. Perf. Susan Hampshire, Philip Latham, Donald McCan. BBC, 1974. DVD. Polhemus, Robert. The Changing World of Anthony Trollope. LA: University of California Press, 1968. Robb, Graham. “Paris a la Epoque de Balzac et dans la Comedie Humaine: la ville et la societe by Jean Yguanin,” Modern Language Review, 90:1 (1995):199. Sadleir, Michael. Trollope: a commentary, 3rd edition. London: Oxford UP, 1945. Smalley, Donald, ed. Trollope: The Critical Heritage. NY: Barnes & Noble, 1969. Snow, C. P. Trollope: An Illustrated Biography. NY: New Amsterdam Books, 1975. Streeten, Bill. “A Trollope Walk,”Trollopiana 29 (1995):21-23. Stryker, David. “The Significance of Trollope's American Senator.” Nineteenth-Century Fiction (1950):141-49. Thrale, Jerome “The Problem of Structure in Trollope,” Nineteenth- Century Fiction 15 (1960):147-57. Tingay, Lance. A Collector's Catalogue, 1847-1990. London: The Trollope Society, 1992. _____-. The Bedside Barsetshire, illustrated by Gwen Raverat. NY: Knopf, 1950. _____-. 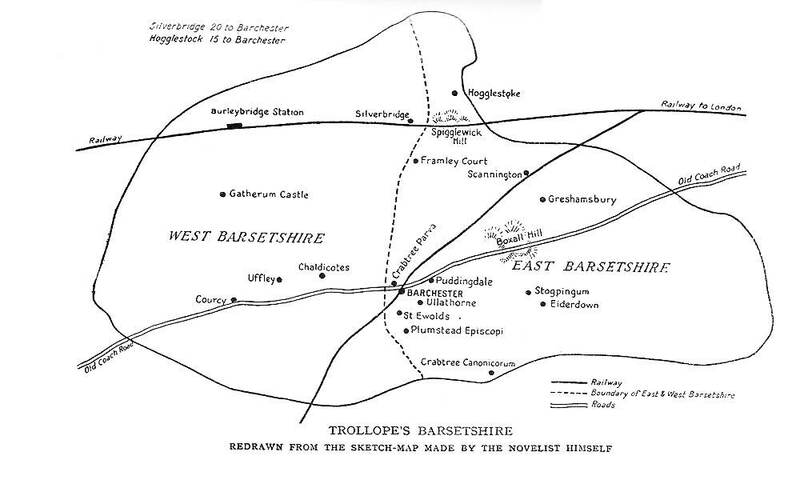 “Mapmaking in Barsetshire,” Trollopiana 3:1 (1948):19-32. Tracy, Robert. Trollope's Later Novels. Berkeley: University of California Press, 1978. Trollope, Anthony. An Autobiography, ed. M. Sadleir and F. Page, introd. Notes P. D. Edwards (New York: Oxford 1980). _____. The American Senator, ed. John Halperin. Oxford: Oxford UP, 1986. _____. Castle Richmond, ed. Mary Hamer. Oxford: Oxford UP, 1989. CR. _____. An Eye for an Eye, ed. John Sutherland. Oxford: Oxford UP, 1992. _____. Framley Parsonage, ed. David Skilton and Peter Miles. London: Penguin, 1984. _____. He Knew He Was Right, ed. David Skilton. London: Everyman, 1993. _____. The Irish Famine: Six Letters to the Examiner 1849-50, ed. Lance O. Tingay. London: Silverbridge Press, 1987. _____. The Macdermots of Ballycloran, ed. Introd. Owen Dudley Edwards. London: Trollope Society, 1991. _____. Phineas Redux. ed. John C. Whale, introd. F.S.L. Lyons. Oxford: Oxford UP, 1983. PR. _____. Thackeray. 1879; rpt. London: Trollope Society, 1997. _____. “The Turkish Bath,” and “The Panjandrum” in Later Short Stories, ed. John Sutherland: Oxford UP, 1995..
_____. The Warden, ed. David Skilton NY: Oxford UP, 1980. _____. Writings for St Paul's Magazine, 3 vols. introd. John Sutherland. NY: Arno Press 1981. Wall, Stephen. “Trollope, Balzac and the Reappearing Character,” Essays in Criticism 25 (1975):123-44. Welch, Robert, ed. The Oxford Companion to Irish Literature. Oxford: Oxford UP, 1996. Wittig, E. W. “Trollope's Irish Fiction,” Eire-Ireland 9 (1974):97-118. 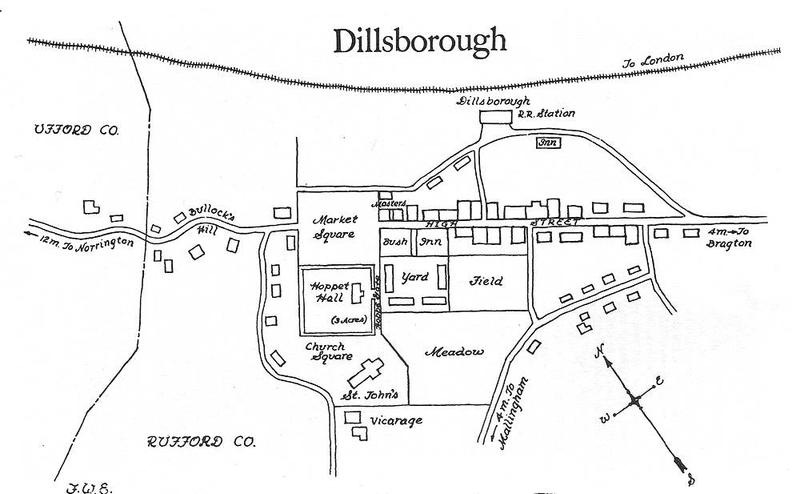 2: This is the map drawn by Bill Streeten; it follows the course Mr. Bonteen and after him Mr Emilius took the night of the murder in Phineas Redux. My argument is that Trollope's visualized maps are a central means by which he organizes and expresses the social, political and psychological relationships of his characters and themes (Harvie 1-27), that they name places important to him personally; and that through his Irish maps he aimed to put Ireland into his English readers' imagined consciousness. In October 1859 he found himself pressured to put aside Castle Richmond, a tale set in Ireland in a famine year 1847, to write Framley Parsonage for the Cornhill, an imagined English county, Barsetshire book, as a successful career move. Trollope's Framley Parsonage has been looked at as the crucial novel which transformed his career; we will look at it as one of two novels4 that taken together reveal Trollope's evolution of a method for writing novels. I will show he visualized the intersection of hierarchy with social behavior and individual psychology in both Castle Richmond and Framley Parsonage by plotting their stories through movements of characters from site to site on a coherent map. Trollope's mapping of Ireland follows his own movements as he lived in different residences to oversee and map postal routes. In 1841 he first came to live in Banagher, a south mid-lands town “permeated by a sense of history” from nearby ruins and ring-forts, and traveled across the province of Connacht, east of Leitrim; the immediate prompting for his first published novel, Macdermots of Ballycloran (written 1843-45) was a mansion in an “unnaturally ruined state” that Trollope came upon while walking in Drumsna, a Leitrim village alongside the river Carrick-on-Shannon (Macdermots 1-3)..
3: This map encompasses the main action of The Macdermots of Ballycloran and indicates one of the central areas in which The Land-leaguers takes place. By 1844 he had moved to lodgings in the borough market town, Clonmel and its nearby mountainous landscape is central to the novel's denouement, which exposes the colonialist paranoia of the Anglo-Irish establishment (Moody, Trollope on the 'Net 6-29). His second novel, The Kellys and Okellys encompasses imagined and real places in counties Galway, Mayo, Kildare, and Dublin, where the action begins with a mass meeting and includes accurate observations on Daniel O'Connell's state trial. Illegal bars and hunting tracks, assizes, and fairs, shops and courthouses, are described with a seeming actuality by use of contemporary events and are precisely enough located so we can know where we are using non-fictional contemporary maps and thus judge the status of the place and characters' activities in the novels' scheme of things. He then labored for months on something like a third of a large travel book on Ireland where he “did the city of Dublin, and the county of Kerry, in which lies the lake scenery of Killarney; and ... the route from Dublin to Killarney” (A 87). He then had to put aside his pen. 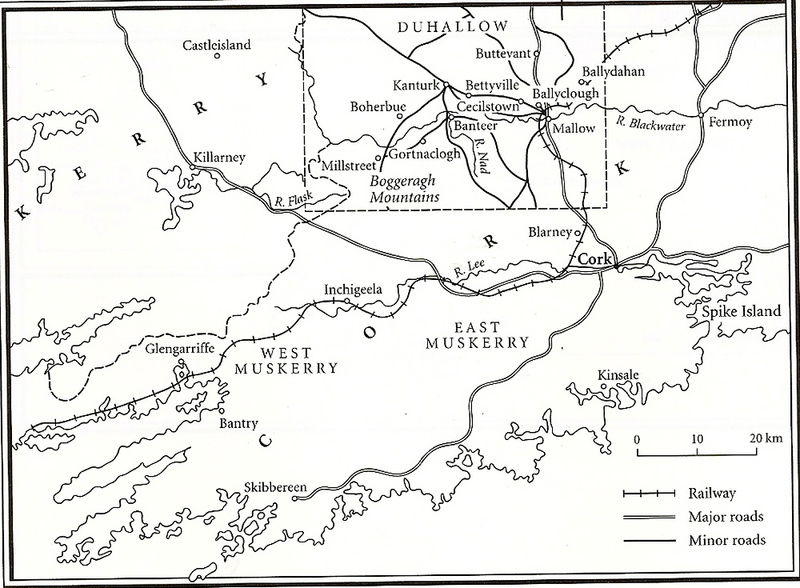 Even he could not write much from 1851 for about two years, when he moved to the southwest corner of Ireland, Mallow (county Cork), where, with nearby Kerry, he set Castle Richmond, and with Mallow as his base, literally rode and drew what he thought were doable mail routes for postmen to traverse across south, west and mid-Ireland, so successfully and efficiently that he was sent to do the same over a wide swath of southwestern England and Wales (A 88).a href="#11">11 In 1853, he returned to Ireland to live first in Belfast, then Donbrook, a Dublin suburb (A 88), and surveyed the Irish northern counties (A 95-96).a href="#12">12 The sites for his last novel, The Land-leaguers include Ulster, Dublin, and Galway, where political murders had just occurred, and he describes houses near and like recognizable ones described in the press at the time (Tracy “Instant Replay” 35-39).13 It was around the time of Trollope's return to Ireland that he conceived Barsetshire while walking near Salisbury Cathedral – I suggest out of thwarted longing for the English countryside. Three years later Trollope visited the cliffs of Mohair, at the extreme western edge of county Clare; when first married he and his wife had visited the cliffs; he made the romantic isolated place central to An Eye for an Eye, the novel of a young English officer's betrayal of a Catholic Irish girl (Sutherland Introd., Eye x).14 Phineas Finn, hails from Killaloe, county Clare, and first stands for Loughshane, imaginary but placed on the confines of Clare, Limerick, Tipperary and Galway (McCourt). Mark Robarts, Trollope's hero, makes the mistake of thinking he can rise by allying himself to Mrs Proudie and the Duke in the west (respectively shown to be power-hungry or a liar). Trollope's older heroine, Lady Lufton in the east fails to understand the inner nature of someone must be taken into account: she rejects Trollope's heroine, Lucy Robarts because Lucy lacks presence as the unmarried sister of Lady Lufton's vicar living in a parsonage. Miss Martha Dunstable, a single woman of no rank or estate, but with large sums of money from sales of a quack remedy, outbids the ever-encroaching Duke for Sowerby's Chaldicotes in the west and thus “restores” a balance of power while Lucy saves the Crawleys in northeast Hogglestock by going there unostentatiously and without regard to what this does to her status to nurse the wife of the impoverished curate, Josiah Crawley. These acts contrast to Mrs Proudie's pretenses she is helping Papua, the Philippines, Borneo, the Moluccas which places in the “Southern Ocean,” Sowerby, the novel's corrupt politician maps in a political speech as part of England's active concern (FP 95-96; Overton 62-63). Castle Richmond relies similarly on a chapter by chapter emerging topographical allegorical description. As the book begins three houses are contrasted symbolically: Desmond Park is ancient Ireland with wooded meadows, but now without funds; its proud Countess of Desmond must marry her daughter, Clara, to a wealthy heir. The solvent Castle Richmond has such an heir, the upright Herbert Fitzgerald, who may however be illegitimate. While the barony of Desmond is “a figment of Trollope's imagination,” the name Desmond is “well-grounded in history” (Godfrey, “Castle Richmond”). Desmond Court is north of Ballvourney and Macroom "in a bleak unadorned region, almost at the foothills of the Boggergah Mountain, and south of Kanturk. 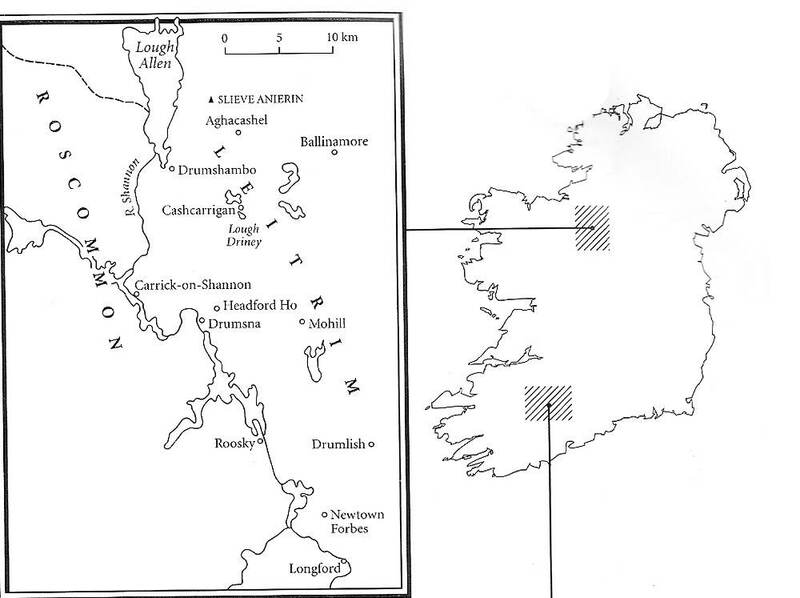 5: This is south-west Ireland where Castle Richmond is set and includes the actual place-names in Ireland in the 1840s, to which Trollope's text calls attention. There was but one window to the ['sitting, or coffee'] room, which looked into the street and was always clouded by a dingy-red curtain … A strong smell of hot whisky and water always prevailed, and the straggling mahogany table in the centre of the room, whose rickety legs gave way and came off whenever the attempt was made to move it, was covered by small greasy circles … [in] the kitchen … lived a cook, who, together with Tom the waiter, did all that servants had to do … From this kitchen lumps of beef, mutton chops, and potatoes did occasionally emanate, all perfumed with plenteous onions; as also did fried eggs, with bacon an inch thick and other culinary messes too horrible to be thought of … [CR, Ch 6, 54-56]. In the novel the defense, prosecuting attorney and witnesses suggest what did or did not happen in these streets, and what the one witness on the dark night, Lord Fawn, saw or thought he saw (e.g., PR 49:79-84; 50:94; 62:197-201; 63:208-9). In the manner of crime stories, to exonerate Phineas someone has to challenge the assertion that a gray overcoat seen on the presumed murderer from afar by Fawn is the one Phineas was wearing that night, and the deduction that therefore the murderer is Phineas. Mr Emilius's alibi depends upon his assertion that he was inside his room inside a boarding house all night because in the general way of such places, the doors were all locked and he lacked a key. One of Trollope's heroines, Madame Max, in love with Phineas, goes on a quest to find a second key. A comparison of her visit to Mr Emilius's landlady, Mrs Meager, and Phineas's obsessive return to the streets in the dawn hours of the night he was declared not guilty as presented in Trollope's novel and the 1974-75 BBC Pallisers mini-series, scripted by Simon Raven,< a href="#18">18 will bring out clearly how status-inflected geography, gender, and streets well outside the corridors of power and upper middle class lives influence the outcome of the trial for the novel's hero and make visible a painful truth he realizes as a result of his ordeal. 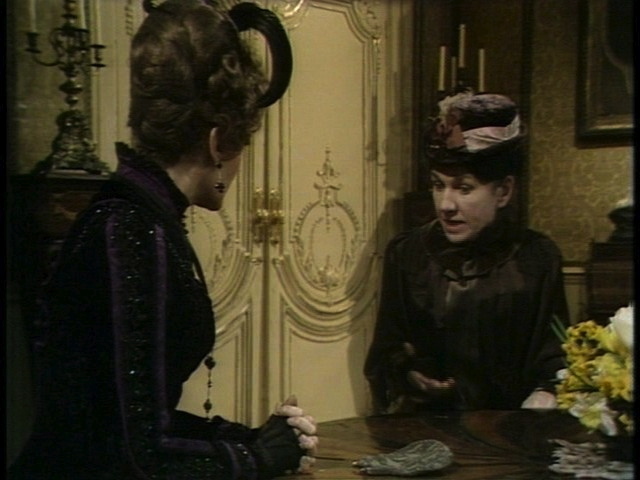 6: Madame Max (Barbara Murray) and Mrs Meager (Sheila Fay), Part 9, Episode 18. from the 1974-75 BBC Pallisers, for which Simon Raven wrote the script. Trollope shows us women with no recognized offices reach needed truths that powerful men could not find because the men ([as Phineas's mentor Monk's (Brian Pringle) dismissive words suggest]) could not be bothered to come to such a low place to look for information nor would Mrs Meager have spoken to such men frankly had they come.20 Raven's dialogue makes explicit Trollope's text's inferences: Madame Max (Barbara Murray) projects real sympathy for the wary-eyed tense landlady (Sheila Fay): “Poor Mrs Meager what a very difficult life you must have.” And thus the existence of an extra key and, unexpectedly, a second gray coat now in the pawnshop, is told of. In the book and mini-series Phineas in a sort of trance obsessively walks the walk Mr Bonteen, after him Mr Emilius and then our Trollopian group in 1999 followed. 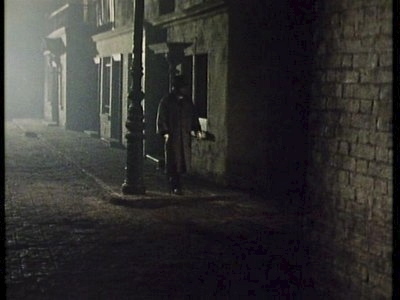 7: What Lord Fawn (Derek Jacobi) Saw, Part 8, Episode 17 from Pallisers, for which Simon Raven wrote the script.
. . . he went on till he came to the end of Clarges Street, and looked to the mews opposite to it, – the mews from which the man had been seen to hurry. The place was altogether unknown to him. He had never thought whither it had led when passing it on his way up from Piccadilly to the club. But now he entered the mews so as to test the evidence that had been given, and found that it brought him by a close turn close up to the spot at which he had been described as having been last seen by Erle and Fitzgibbon. At the novel's close Arabella is relieved to emigrate to Patagonia (AS 76:530) with a husband who is an upper clerk in the foreign office whose name, Mounser Green, is a version of Trollope's own surrogate in some short stories. Amid the many stages of her trajectory, I single out a crucial one where Arabella unflinchingly breaks through all barriers surrounding and within the estate of Lord Rufford, a rich landowner and aristocrat whom she insists has asked her to marry him. She accosts Rufford in his park (AS 66-67:457-68), accuses him of treating her cruelly and challenges him to deny he asked her to marry him. In fact, he had only kissed her and allowed her to imply that he loved her (cf AS 39:266-68 and 67:464-67). The narrator dubs her “a kind of Medea” to Rufford's “Jason” (AS 66:457). She wins Rufford's admiration, but Lady Penwether, Lord Rufford's sister, standing just inside the house by the door Arabella went through, interferes by sending Lord Penwether whose presence stops Rufford and Arabella's debate with an invitation to a dinner Arabella rightly refuses to be tempted by. Arabella's final ejection is expressed as a site: “It seemed to her as she stood by the lodge gate, having obstinately refused to enter the house, to be an eternity before the fly came to her” (67:467). I have written elsewhere about the brilliance of the individual interwoven correspondences placed throughout this novel: these expose the economic and social antagonisms of the human communities from which each is sent.23 Characters' natures as seen by others change as these games of ambition work out. Once one of the novel's heroes, Reginald Morton, hitherto apparently solitary, even bookish (AS 27:181), inherits the beautiful Bragdon Estate. 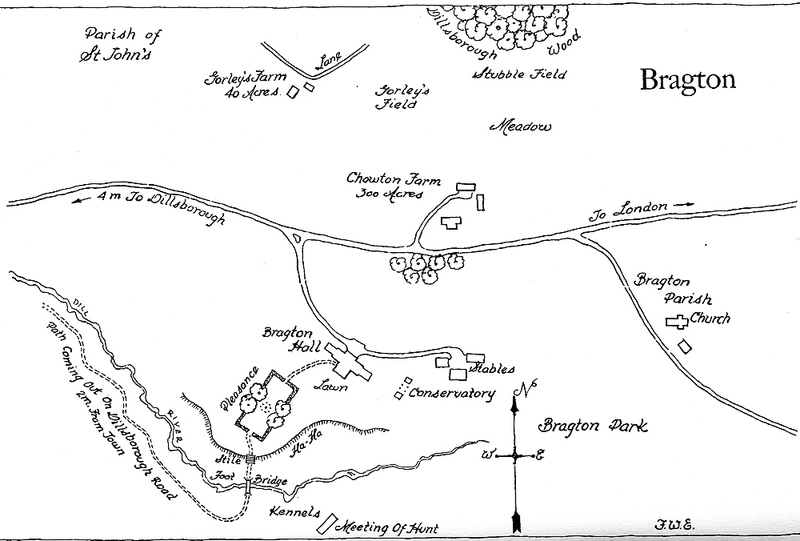 9: The Bragton Estate, fought over by the Morton family, where Mary Masters grew up, and at the end of The American Senator inherited by Reginald Morton (another of the 9 maps). Reginald takes up hunting and participates in the community life as is required of a squire (AS 79:546). The novel's exemplary heroine, Mary Masters, has grown up to be lady-like since she was brought up at Bragton by Reginald's aunt; all novel long Mary's jealous stepmother will not allow her a private space in her father's house secure from harassment because the stepmother wants Mary to marry a farmer and tries to prevent her from visiting Cheltenham where Reginald's aunt lives genteely. The theme is given good-natured comic rendition in a chapter about a parrot on a train who echoes the characters in his carriage area pointedly and has to be silenced by a cage cover (AS 27:180-87). 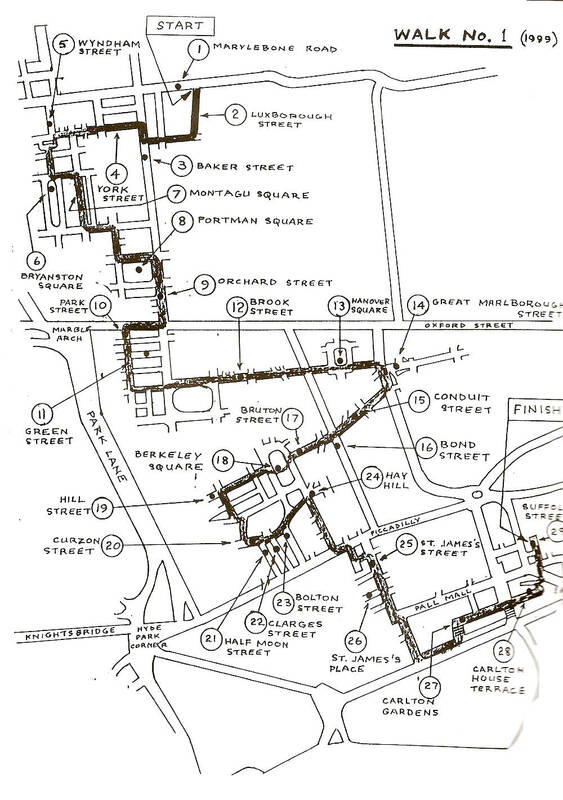 10: A diagrammatic outline of the places in London Trollope's novels encompass (probably by Bill Streeten); comparable to the outlines Moretti draws of Balzac's Paris and Dickens's London (Atlas). Here he branches out to include places where the privileged find they must cope with the people they find there. In his last books habitual social arrangements and status protections attached to places are shown to be fragile but all the more clung to by the characters who can manage it. And he never forgets his own involvement. Trollope's maps reveal a powerful political, psychological and autobiographical imagination at work making the Trollopian imagined worlds his readers react to as true and which some scholars have argued accurately represent his 19th century worlds. Last modified 30 July 2013.